In Idaho Falls, it is a race to get your leaves raked before the snow falls, because when it falls, it falls hard and is there until the first week in July! And no one likes soggy leaves in the summer! We were lucky to have one mild evening before it got dark after I got back from work to rake for 1 hour and get some really great piles-but of coarse we took a minute break to jump a few times and take the opportunity for a photo before we had to bag this last one up! I am grateful for hard working kids that help lighten that huge load! In October my mom rented a cabin in West Yellowstone again and we all traveled there to have a fun filled weekend. It was so fun. The weather was gorgeous and Yellowstone, of coarse did not disappoint. It is always nice to be there with my family. It is one place that I go where I feel like my dad MUST be with us. I feel close to him there. It was one of his favorite places and therefor I love it there more than I probably would without his love for it. 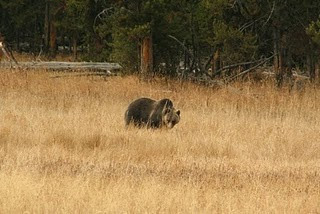 We hit the regular spots in the park, saw a bear FINALLY!!! !, did some shopping in West, ate some really yummy meals, and spent some fun memories together at the cabin. My favorite though was when we were together one night in the front room and Michael and Calli were playing their guitars and we were all singing along. It was fun and funny! For the end of the month, we celebrated Halloween by going to the hay maze which ended up being really cool! I am never sure about the "unsure" and I was worried that when we got up there, we would end up getting lost in it or something and then we would be late to the ward party that we had that night which I had committed to taking part of the dinner. However, we were in and then out within 15 minutes. Quentin even went in for another trip around. The kids had a blast! We stopped at Grandma's so that she could see the kids in their costumes and then off to our party where there was dinner and then trunk-or-treating for the kids. Mack was a Storm Trooper (or some other Star Wars character...) and Calli was a Twister game. She even painted her nails white with blue and red polka dots.